There's a good reason why they're called the "Dog Days of Summer." From the Latin diēs caniculārēs, the term originated with the Romans' belief that the star Sirius - the "Dog Star" was, because it rose at the same time as the sun - was responsible for sultry weather, and must be appeased. It's commonly thought that the Dog Days end in late August, but in TV terms, the ending comes with the beginning of the new season. In this week's issue, ABC kicks off its new season, and even though the official Fall Preview isn't for another week, that's close enough for me. 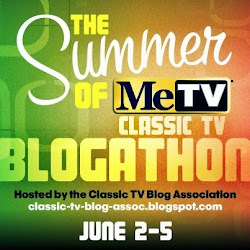 I've made no secret that the summer months can be slow; many shows are reruns, and the remainder of the schedule tends to be filled out with anthology collections of failed pilots, and summer replacement series that rarely catch fire. But this issue is chock full of irony and newness and the return of old friends and all the other things that make television so much fun. 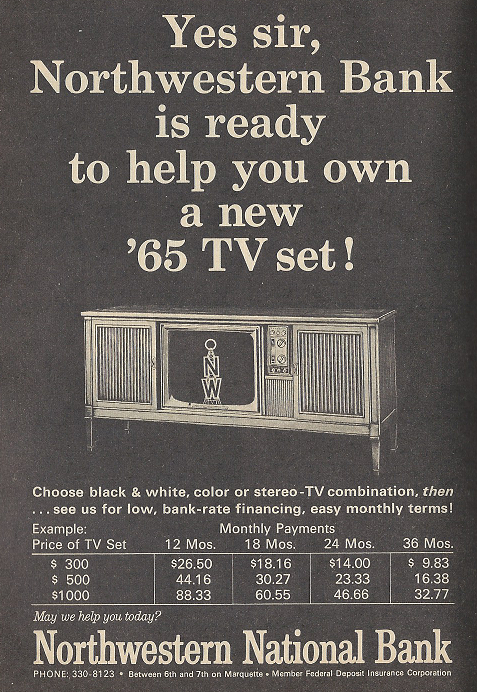 Let's start with the new, and a look at the new TV sets for 1965. A couple of weeks ago, you may remember that I had a bit about the new "smart" televisions for 1981. That generated something of a "Meh," seeing as how virtually everything discussed in the article had come to pass, and in fact is pretty much of a given today. There was, in other words, no "a-ha" moment, when you could literally see the future coming to life before your eyes. Such is not the case this week. The premise of Henry Harding's article is what you can expect in the television set of 1984, and he warns us ahead of time that the prophecies "may amaze" us. 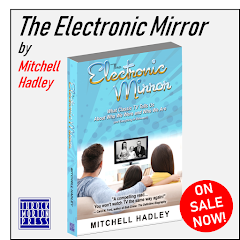 For one thing, he speaks of a television set that is virtually invisible - mounted on the wall, measuring about four-by-three feet, and with a thickness of about two inches. There are no cords; they're hidden in an outlet behind the set. You don't really notice the set, either - when it's not on, it assumes the guise of a Picasso painting, something of a screen saver that shows when the set's not being used for anything else. This set is the centerpiece of a "Home Communications Center," perhaps smaller than the average 1964 console set, which sits by your chair or sofa. From this center you can control your television (via 25 or so push buttons representing each channel," plus you have the ability to record and playback programs on a video recorder via a small tape cartridge. You can make your own recordings, using a miniature battery-operated camera that allows immediate playback, rather than waiting for the film to be developed. And that's not all - you can get your newspaper, or anything else, faxed to you through the center. You can watch video books brought home from school or the library. You can watch video from security cameras placed in various locations around the house. You can make video phone calls that will show on your television. You can make use of the TV shopping service that allows you to purchase everything from clothes to groceries - just push a few buttons, and your computer will do the rest. And as far as the "television" programming you'll see - it's all in living color, Some of the broadcasts are international, being beamed to your set via satellite, and an automatic translator will convert to English any broadcasts that are being presented in another language. There will be educational channels, local access broadcasts - pretty much anything you can imagine. You're not limited to seeing them on your big screen, either; a portable unit, covering "one entire flat surface of the brief-case," will operate via battery or solar power, and, weighing less than four pounds, will provide "clear, bright color pictures." Now, to be fair, it might have been premature to expect all of this by 1984. But, frankly, just about everything else in this article has come to pass in one form or another. Flat-screen television? Check, down to size and width. Cordless? Check. 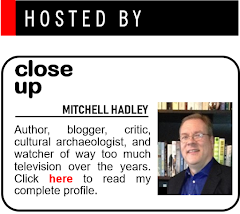 (Just ask Dish.) Videophone? Try Skype. VCR? Already come and gone, replaced by DVDs and DVRs. The brief-case sized TV is today's mobile device. The automatic translator is called SAP, and while . The newspaper may not be faxed to you every day, but you read it (or anything else) online, And don't even get started with home shopping networks. Harding predicted that people would even be able to do their own repairs on their units, rather than calling a technician. I'm not so sure about that - most tech help desks are still doing good business, and many times it's more economical to replace than repair. But otherwise, I think this article presents a remarkably accurate portrait of today's technology - sometimes off a bit on the detail, perhaps, but spot on as to the end result. Reading this today, and gradually developing a sense of amazement as one recognizes these predictions coming to live in various gadgets, is little less than astounding, at least for one who was alive during this time, and saw all these things come to fruition. One can only imagine how outlandish they might have seemed in context, presented to one reading about it in 1964. A last note here - Harding asks for your forbearance at the end, reminding us that "If this vision of the future home communication center seems far-out to you," remember that the whole idea of "electronic home television" was absurd to many when it was first presented in 1926 - only twenty years before the first household set was produced. And now for something ironic. 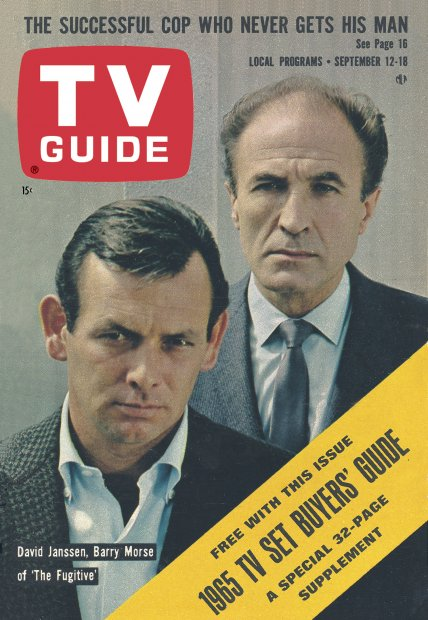 You'll note that on the cover we have David Janssen and Barry Morse, stars of ABC's hit series The Fugitive, about to enter its second season. Even with just one year under its belt, the concept must already have taken hold, as you can see in this first-run episode of CBS' The Defenders on Saturday night. The premise: "When the train taking him to the Sing Sing death house is derailed, condemned murderer Bernie Jackman kills a guard and escapes." OK, as far as it goes. This could be a parody (yes, even a show as serious and earnest as The Defenders did do comedy once a year), or it could be a Law & Order-type "ripped from today's headlines" episode, even if those headlines were generated by an opposing network's show. And then we get to the twist - the second half of the episode's description: "What Jackman doesn't know is that he had just been cleared of the previous murder." Ironic, yes - the storyline, told in isolation, is the stuff of Greek tragedy. But brilliant also, taken in the context of coexistence with a program built on a very similar storyline. Larry Cohen's script turns The Fugitive on its ear; imagine Kimble killing Gerard after the derailment, while back in Stafford, Indiana Gerard's superior has just picked up the one-armed man. This is no mistake, believe me. I'm quite sure Cohen knew quite well that he was lampooning the premise of The Fugitive, while at the same time giving us a vicious turn of events. I've always admired that "what-if" mentality of taking an established idea and spinning it around until it goes in a different direction. I do it a lot myself. And while I don't know how successful this episode ultimately was (I'm assuming that the Prestons must have been defending Jackman, for example), I can imagine I might have enjoyed the episode immensely. Perhaps some of you out there (Mike Doran, for instance) can shed some light on how it was received. There's no "Sullivan vs. The Palace" this week, although The Hollywood Palace is entering its ninth month on ABC, as Palace is preempted this week by the Olympic Trials from Los Angeles. ABC, however, has something bigger in mind for the stage of the Palace. 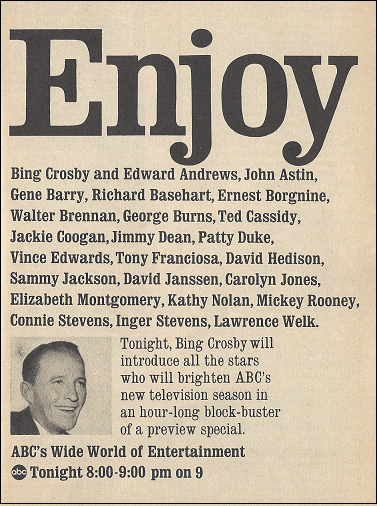 It's ABC's Wide World of Entertainment, a gala one-hour special hosted by Bing Crosby, and meant to introduce to us the stars of ABC's new and returning series. 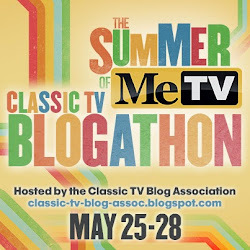 There are songs, clips, and simple walk-ons by the network's biggest stars: Elizabeth Montgomery, promoting her new show Bewitched, Mickey Rooney, star of the new series Mickey, Richard Basehart and David Hedison from Voyage to the Bottom of the Sea, John Astin, Carolyn Jones and Ted Cassidy from The Addams Family, and more. Bing himself is plugging his new series The Bing Crosby Show. You've also got Ernest Borgnine, Jimmy Dean, Gene Barry, Patty Duke and others plugging returning series, some of which have moved to new time slots. It's interesting, looking at this list. Just by looking at the names of the guests, you can usually figure out what shows they're associated with (George Burns and Connie Stevens in Wendy and Me, for example, or Inger Stevens plugging The Farmer's Daughter). 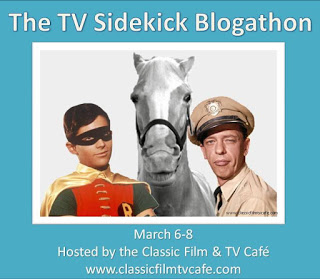 And while some of them were real bombs (Valentine's Day with Tony Franciosa, Walter Brennan in The Tycoon), a fair number of them have entered classic TV folklore. 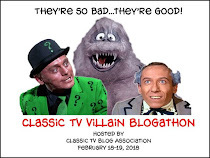 ABC seemed to do particularly well with sci-fi/fantasy, considering Voyage, Bewitched and Addams, as well as Combat!, McHale's Navy, and The Fugitive, among others. Not all of them were long-running series (Addams ran a scant two seasons), but all of them were recognizable. That's not bad for a network with a track record as weak as ABC. As I mentioned at the top, there's a lot of "welcome back" about this issue. Football, for example. At the ungodly hour of 10:45 CT on Saturday morning, NBC kicks off the new college football season with an interconference clash between UCLA and Pitt, live from Pittsburgh. UCLA wins, 17-12, but it's a rare bright spot for the Bruins, who end the season with 34-13 thrashing at the hands of USC to finish with a record of 4-6. Pitt's season isn't much better - the team winds up 3-5-2, including a 28-0 thumping from its hated rivals, Penn State. The reason for the early start, by the way, is to accommodate 45 minutes of highlights from the men's semifinals at the U.S. National Tennis Championships at Forest Hills, New York. It's not called the "U.S. Open" yet, because it's not open to professionals - amateurs only. That cuts down on some of the great players, to be sure - stars such as Rod Laver, Ken Rosewall and Pancho Gonzalez are nowhere to be found. No matter; a couple of players who went on to some degree of success, Roy Emerson and Fred Stolle, meet in the final on Sunday, with the top-seeded Emerson taking the title. Sunday marks the kickoff of the pro football season. There's only one game on television, the Kansas City Chiefs taking on the Bills in Buffalo in ABC's AFL game. That suggests to me that the Minnesota Vikings must have been playing at home, triggering a blackout of all NFL games in the area - let me check, yes, I'm right: the Vikings beat the Baltimore Colts 34-24, en route to a very successful 8-5-1 season. (The Colts, on the other hand, would lose to the Cleveland Browns for the NFL championship; after that loss to the Vikings they would not drop another game until the next-to-last game of the season in Detroit.) As for the Bills and Chiefs, 34-17, on their way to winning their first of two consecutive championships. This is, by the way, the last year for the AFL on ABC - next season they'll move over to NBC, as the bidding war between the two leagues escalates. There's still baseball, in the waning days of the season. The Twins are on Channel 11 with two games over the weekend with the Yankees (preempting the Saturday national Game of the Week), and later tilts against the Orioles and Red Sox. And, if you thought two football games on the weekend wasn't enough, there's bonus coverage on Wednesday: the Edmonton Eskimos and Toronto Argonauts in CFL action taped Sunday, the first of eleven weekly telecasts. I'm pretty sure that's what I would have watched - Canadian football held a strange attraction for me as a boy, one that's lasted to this day. Last week we had the Miss America pageant, and guess what - it's back this week! 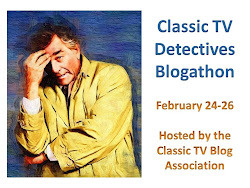 Actually, owing to the vagaries of the calendar, it's just a week later than it was in 1979, and it's on a different network - CBS instead of NBC - but much else is the same. 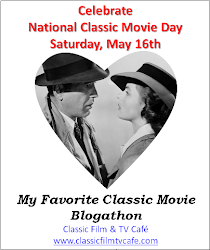 The pageant is still in Atlantic City, New Jersey, with a start time of 9 pm CT; Bert Parks is still the host (his tenth of twenty-five years in the role), and the lovely Bess Myerson, Miss America of 1945, is the television hostess. Parks is quoted in the Close-Up as saying ,"This year I hope to win! "* but in actuality the winner is Miss Arizona, Vonda Kay Van Dyke, who went on to a career as an author and singer. *I don't remember the commercial now, but late in Parks' career as Miss America host, he did a bit where his line was, "Miss Americas may come and Miss Americas may go, but I'll go on forever," concluding with a somewhat uncertain expression, as if he were knocking on wood. It was a few years later that he was sacked, replaced with Ron Ely. Remember him? Laugh - and that's an order! 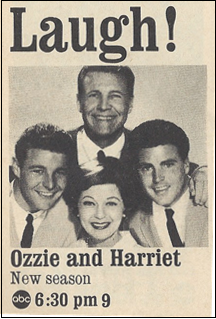 On Wednesday night, it's the 13th season opener for ABC's Ozzie and Harriet, and the debut on the same network of the rock music show Shindig, with Sam Cooke, the Everly Brothers, Donna Loren, the Wellingtons, Bobby Sherman, the Blossoms, comic Alan Sues, Jackie and Gayle, and the Righteous Brothers. All in a half-hour. Over on CBS, Harry Reasoner narrates a special entitled "Politics is a Funny Business," concentrating on the role of humor in American political life. And you thought Ozzie was outdated? Speaking of Ozzie, it's hard to believe that The Donna Reed Show is still on the air, but it makes its season premiere the following night. It's even more interesting when one considers that later on Thursday night, ABC airs the second of the two-night debut of Peyton Place. But it's only the seventh season for the show, which will run for one more season after this before leaving the airwaves. Why does it seem as if it were on for so much longer? 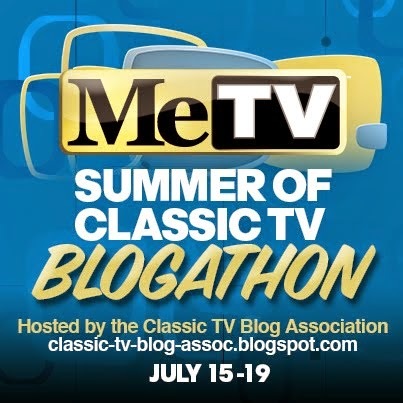 Perhaps because shows like Donna Reed and Ozzie and Harriet (which also went off the air in 1966, after 15 seasons) are thought of as presenting a simpler, idealized America, one that's been ridiculed so much over the years. Perhaps they were already something of an anachronism in 1964, but by the time they leave for good in 1966, they're coexisting with free love and Vietnam, which make them really stick out. And on Friday, ABC premieres Jonny Quest and The Addams Family, while CBS airs Route 66 for the last time. Route 66 was one of the few (for the time) shows to offer something of a final episode, as Tod (Martin Milner) finally settles down with a girl, leaving Linc (Glenn Corbett) to roam the country solo. 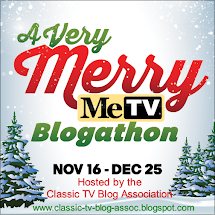 Interestingly enough, though, this final airing is from one of the show's first three seasons, with Tod's sidekick being the far more popular George Maharis as Buzz. Good issue, don't you think? It's true - there is something about the fall air that makes everything seem fresh and new, even though as I write this it's 96 and sunny in Dallas. But then, fall is kind of delayed gratification down here - it'll get here sooner or later. Hopefully next week's issue will be just as good as this one, but we'll just have to see. Don't forget - It's About TV is now on Facebook! Please follow me for additional content and teasers to upcoming posts! First off, that wasn't a "first-run" episode of The Defenders. It couldn't have been - it was on Saturday, the week before CBS kicked off its new season, for which The Defenders was moved to Thursday nights. You made things a bit tough by not giving the episode title ("Kill Or Be Killed") or IDing the actor who played Jackman (Gerald S. O'Loughlin) so all I had to go on was writer Larry Cohen. That was how I found it. "Kill Or Be Killed" aired on January 5, 1963. midway through Defenders's second season - and eight months before the premiere of The Fugitive. By the way, this would put the filming of the episode in late 1962, well before ABC picked up The Fugitive as a series. The Defenders seems to be a "lost series"; CBS, which (as far as I know) owns (or owned) the show, apparently has no plans to restore it for either syndication or MOD-DVD release. Remember, this was back when TV series ran 30 or more episodes a season. O&H ran 15 years, DR ran 8 - do the math. The subject was, of course, Barry Morse - and this story was likely the first time many watchers found out that Morse was actually British, and a full-time resident of Toronto, Canada. It was about this time that Barry Morse made a few talk-show appearances. It was hard to tell what threw the hosts more: his RADA British speech or his highly genial manner. Morse even sang on a couple of shows - Noel Coward and English music hall novelties, mainly. I fully expected Morse to become a reasonably frequent talk-show guest, but for some reason that didn't happen. It certainly wasn't unavailability - Morse only did 10 Fugitive episodes in any given season (out of 30 a year - look it up). Also, Morse did outside guest appearances on other shows - like The Defenders, on which he played a drunken Welsh poet who was -ready? - falsely accused of murder (now there's irony). As I write this, it's 60-something and cloudy in Chicago. It'll be the same tomorrow when I get up early to go far west for a book signing by my friend Max Allan Collins (look up his stuff - you won't regret it). Anyway, you got questions, you know where I am. Wow! The new 1965 model TVs are here. Have to go grab one of those RCA New Vista color sets with the round tube. Whether or not you have kids, a neighborhood within a excellent university region talks amounts of its environment. Neighbourhoods with excellent educational institutions are more often than not in more secure neighbourhoods with family members that force for high knowledge requirements. This is often hyperlinks to a greater requirements of residing to sustain a better total well being, in the group. If you don't have kids, then keep in mind that you may want to gradually offer your home and a excellent university region gives you make use of in a aggressive market.